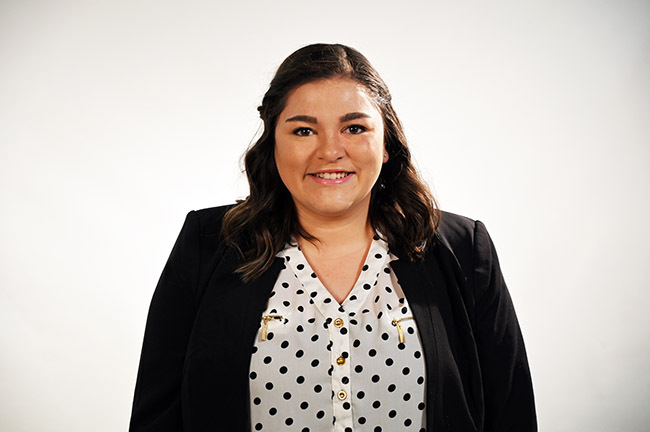 Miranda Ochoa, a senior business student from Richmond, Indiana, has recently been selected as the student commencement speaker for the 2019 Commencement Ceremony that will be held at 6:45 p.m., Monday, May 6, at Freedom Hall at the Kentucky Exposition Center. In addition to being this year’s commencement speaker, Ochoa has served as a resident assistant in the campus lodges and as a member of the Marketing Club and the National Society for Leadership and Success. She also worked as a peer mentor for three years, helping first-year students transition to college by offering guidance and advice. Ochoa is one of eight 2019 Chancellor’s Medallion Scholarship recipients and will be honored at the Chancellor’s Medallion dinner in April. She has received the IU Southeast McPheeters Scholarship, and she was chosen to speak at the Scholarship Luncheon in November 2018, which was a stepping stone in her decision to speak at commencement. Why did you decide to attend IU Southeast? My mother graduated from IU East so I have wanted to go to an IU school since I was a little girl. My sister attended IU Southeast the year before I came, so I was able to walk around and tour the campus before applying. I fell in love with the dorms immediately because they were so spacious and made me feel safe while on campus. I also liked the small size of the campus, which meant a short walk to my classes and not a commute to class. When I finally had my orientation, I knew that this was the school for me, and I was welcomed with open arms. My major is business with concentrations in marketing, professional selling and general management. I chose this because my mother has a degree in marketing and watching her work growing up and seeing the tasks that she did, I really enjoyed it. In college, I was required to take introduction courses for all the concentrations, so I knew after my first marketing class that marketing would be my first major. A few courses later, I realized how marketing and sales work hand in hand and added that concentration as well. What is your favorite memory of your time here? This is a very tough question, I do not think of one “moment” that was my favorite memory at IU Southeast, but I will say my experience with the Residence Life & Housing Office over the last two years have made my experience on campus so much better. I have met so many different people from all over the world and built a small community within a lodge with my peers. I have watched many residents grow up in the short period of time that they have lived on campus, and it is just a very rewarding job to have these past two years. I have made lifelong friends because of living on campus and I am so thankful for the opportunity of being a resident assistant. What made you want to be this year’s commencement speaker? I never wanted or thought that I would be the commencement speaker, so this was a complete surprise to me. I was approached by one of my mentors on campus, Abbie Dupay, who is the Director of Residence Life & Housing a few weeks after the spring semester started. She asked me if I had ever considered speaking at commencement. I sat for a moment and thought about it and was terrified. I knew it would be a big responsibility but also a great accomplishment. I know that I have been very successful and involved on campus, so I knew at that moment I would have a decent shot in being chosen. I will be staying in the Southern Indiana area and I’m hoping to work in a marketing or sales position in the radio industry in the future. I have interned for a Louisville media company twice, so I hope that I will work for them full-time after graduation. How do you think IU Southeast has prepared you for the future? In both of my internships, I have noticed that the skills and knowledge that I have learned in my classes have paid off and helped me succeed. Specifically, in the business world, there are many basic things that all working professionals need to know that I learned while at IU Southeast. Also, there are many mentors that I have on campus that have taught me a lot about the professional workplace and life that has prepared me for what to expect in the future. What does it mean to you to be graduating from IU Southeast? My mother is an IU graduate, so I have always wanted an IU degree. I have always dreamed about going to college and getting my degree. It was never an option for me because I went into middle school knowing that I wanted to make a living for myself and have a career that I loved, and college was the way to achieve that goal. It is very crazy to think that my college journey is over, but I am very excited to start my career and become a working professional.